Beat Places to Run in the US this Fall. Summer is going, going, gone. And while many people will lament the passage of the last season, runners everywhere are rejoicing for fall. Fall foliage and crisper, cooler temperatures are the perfect combination for an outdoor run. It gives you a better environment for exercising and you get to enjoy the scenery too. When it comes to running in the US, these are the absolute best places you’ve got to run this fall that are so incredibly beautiful you’ll never want to run on that treadmill again. In the Pacific Northwest, this trail is a mere 30 miles in length, which seems miniscule in comparison to the Appalachian Trail. However, this Portland, Oregon trail winds its way through the largest urban forest in the states. You can enjoy views of Mt. Hood and run along under fir and cedar trees as well as over meandering streams with prehistoric vegetation that will make you feel like you’ve taken a leap back in time. Learn more and photo by Tomas Arriaga. In Boston, this bike and hike path is just three miles long, but it’s the jaunt from the Museum of Science to Boston University’s famed bridge that provides some of the most incredible views for Bostonians as well as visitors alike. And if you want to extend your scenic fall run through one of the most timeless cities in the nation, you can keep going across the other bridges to get a good 17-mile journey out of it. It’s worth it to get a glimpse of MIT and Harvard, as both campuses are renowned for their incredible foliage and fall scenery. Learn more and photo by Jonathan Ellinger. North Dakota seldom gets any recognition but this trail really makes it stand out. 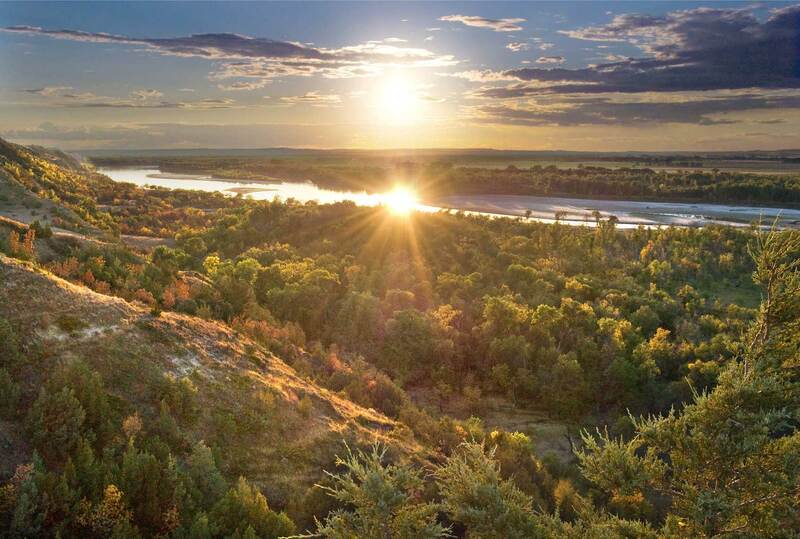 The rock formations and grasslands make this former Native American trade route that connects to the Theodore Roosevelt National Park a 96-mile track, the longest single track in America. If you keep on running through the south part of the trail to Sully Creek State Park, that’s where you’ll find the Petrified Forest, a true beauty to behold. Learn more and photo by Maah Daah Hey Trail. Previous Post Get a Prime Orlando Location at Days Inn Orlando International Drive on Your Vacation!